Is Your Credit Union Making The Non-Interest Income It Should? IWS Guarantees You Will. Gulf Coast Federal Credit Union is renowned for member service. 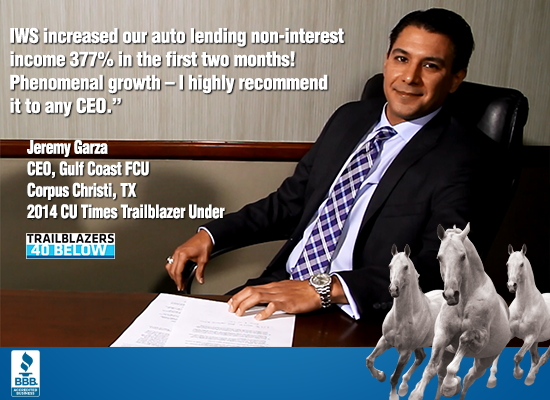 Recently appointed CEO Jeremy Garza – a Credit Union Times “Trailblazer Under 40” – is comfortable taking some risk. What he got from IWS was no-risk, increased member protection AND guaranteed non-interest income. (View the full video interview below.) “The IWS Product Information Center changed a lot. Not to mention our members love the product and service – so much so they’re referring their relatives and friends.”Please encourage your CEO or Chief Lending Officer to complete the form above to hear how IWS will guarantee* you the non-interest income you should be making. *No fine print catch here – we guarantee our results.